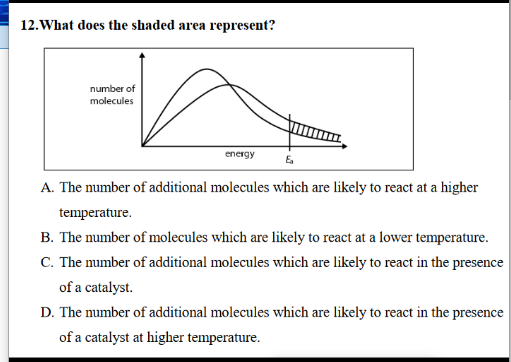 I'm not sure what the answer is, all of my friends and my chemistry teacher said it is A, I think it is obvious that the graph is talking about 2 catalysts so it could be D. But I have no idea what the E_a thing is, I've tried googling it to no avail. I got this question on an advanced Chemistry test. One thing for sure, it is not B because the word "additional" isn't there. And another thing, we can't say that one is the graph of the molecule without a catalyst and the other is its graph with a catalyst because according to the graph that would mean that sometimes the molecule without a catalyst is more active than without a catalyst which is obviously wrong. Jayegh Group is engaged in Manufacturing, Trading, Imports & Exports of Ferro Alloys, Metals, Minerals & Chemicals, Metal Powders manufacturer & Inoculants and Steel Strips. These merchandises are used as raw substances for various industries which include Welding Electrode, Flux Cored Wire, Wear Plates, Powder Metallurgy, Hard Metal, Diamond Tools, Special Alloys, Aerospace, Colour Ceramics, Foundries and Steel Plants.